from the Joshua Tree National Park in California. A team of scientists has released a paper in the March edition of the Journal of Cosmology supporting claims from an earlier study, that a meteorite that crashed in Sri Lanka in December 2012 contained extraterrestrial fossils. The initial paper, "Fossil Diatoms in a New Carbonaceous Meteorite," was published in January 2013 and subjected to criticism that the diatom fossils (a form of algae) found in the meteor had been contaminated by earth water and the fossils were terrestrial in origin. The new study authored by a team of scientists from Cardiff University, University of Buckingham, and University of California San Diego, found that the rock was definitely a meteorite and that the meteor had not been contaminated, and the fossils in it were ancient. 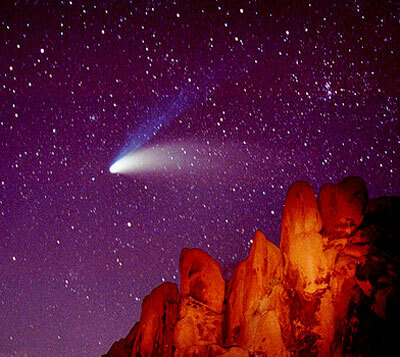 The new scientific study gives strong support to Professor Chandra Wickramasinghe’s theory of Panspermia, that ancient microbial life has spread throughout the galaxy by comets. The new scientific study, "The Polonnaruwa Meteorite - Oxygen Isotope, Crystalline And Biological Composition," appeared in the March 5 (2013) edition of the Journal of Cosmology. "is the strongest evidence yet of cometary panspermia." The March 5 study directly addressed the main criticism leveled against the January paper that the meteor rock samples were contaminated by Earth water, and that the Diatom fossils were of terrestrial origin. …the diversity present in the images represent a wide range of evolutionary history, such that the "source" of the diatoms from outer space, must have gone through the same evolutionary events as here on earth. There are no extinct taxa found, only ones we would find living today…for me it is a clear case of contamination with freshwater. Plait and other critics used Kociolek’s claim that the meteor sample was contaminated by freshwater. The presence of a number of carbonaceous biological structures exhibiting severe nitrogen depletion is highly indicative of ancient fossilized biological remains. Some of these were deeply integrated in the surrounding mineral matrix suggesting they could not have been recent terrestrial contaminants. "The presence of fossilized biological structures provides compelling evidence in support of the theory of cometary panspermia first proposed over thirty years ago." The new study is sure to raise more scrutiny of the Sri Lankan meteor sample and the idea that life is quite common throughout the universe, and can be spread by comets.